Xiaomi has officially introduced the Redmi Note 4X Hatsune Miku Limited Edition in China. It's an Android powered smartphone named after the popular hologram singing idol (Hatsune Miku) in collaboration with Crypton Future Media, Inc. which will be sold this Valentines season. This machine is powered by Snapdragon 625 chip and 4,100 mAh of battery! The full specifications of said device have not been revealed yet, but Xiaomi has confirmed few promising details about the phone. The handset is a promising midranger equipped with a 5.5 inch FHD (1920 x 1080) resolution screen, run on with the efficient 64 bit Snapdragon 625 octa core processor, 13 MP main camera sensor, and quite large 4,100 mAh of battery capacity. See also: Xiaomi Redmi 4X With Snapdragon 435 Announced! Apart from the Hatsune light green like color, the handset will also be available in champagne gold, matte black, cherry powder, platinum silver, and grey color variants. 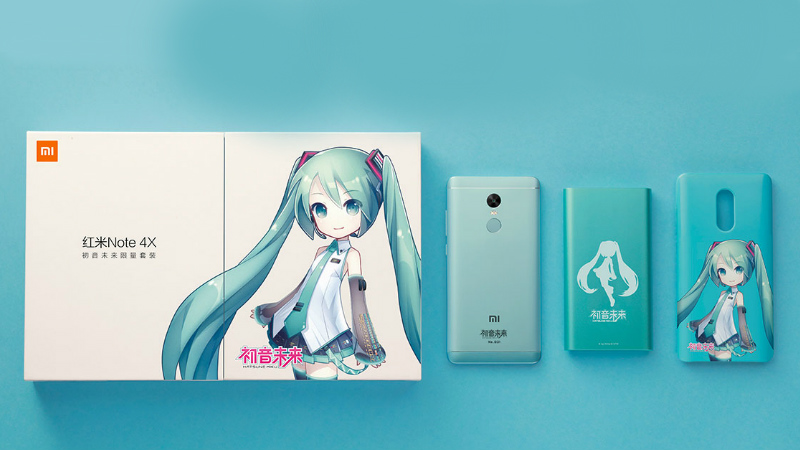 The phone will also be bundled with a FREE Hatsune Miku branded back case and Mi power bank. There's no word yet about the rest of the missing spec, details, and pricing. We'll keep you guys up to date!